The Taiwanese mobile network operator is to field test an innovative NFC device that supports both card emulation mode for payments, ticketing and customer loyalty applications and tag reading for mobile marketing applications and communicates with the user’s phone via Bluetooth. Taiwanese mobile network operator Chunghwa Telecom has begun recruiting six hundred participants for a pilot test of an innovative new NFC device that communicates with a user’s phone via Bluetooth. EasyCard emulation. The device will act as a virtual version of the EasyCard prepaid contactless transport ticketing card that is used by commuters in Taipei to pay for travel fares, for payments at retailers such as 7-Eleven, Starbucks and Pizza Hut and for other travel-related services. Users will also be able to view a record of their last six transactions and obtain their prepaid account balance via the Bluetooth link to their mobile phone. Bicycle rental. Users will be able to use their EasyCube to rent bicycles through Taipei’s UBike bicycle rental scheme. Coupon and discount downloads. EasyCube users will be able to read tags embedded in smart posters to obtain special offers on products and events. Two services are available, one delivered directly by Chunghwa and the other via Vpon, a mobile marketing and coupons service with 1.5m opted-in consumers. 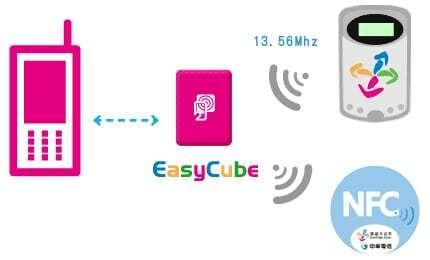 Chunghwa is also making the EasyCube devices part of a mobile guided tour service it is to offer at the Taipei International Flora Expo which begins next month. More than 3,300 flower species on display at the exhibition will be accompanied by detailed information that Chunghwa subscribers will be able to access by dialling a recorded message, scanning a mobile barcode or, if they have an EasyCube, reading a tag attached to the display. 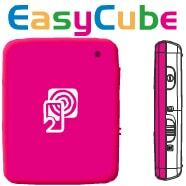 EasyCube currently works with phones running Java and Android. For the future, Chunghwa says it plans to add support for payment by credit card and for peer-to-peer information exchange. Up to 10,000 units, in a variety of designs and form factors, are expected to be issued in the year ahead.